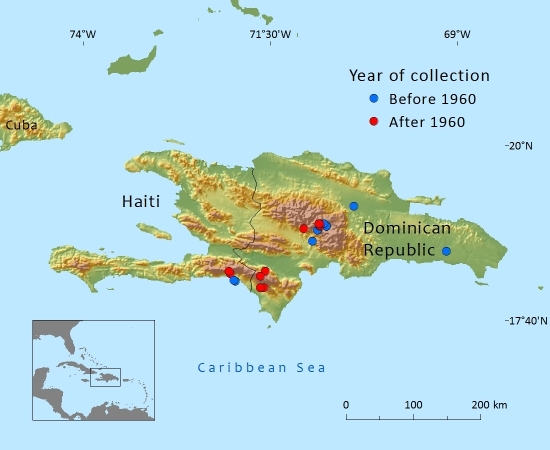 Dominican Republic and Haiti, very localized in relict populations. This species consists of three varieties, two of which are extremely localized. The nominate variety is more abundant, but still occupies a limited area. The total number of mature individuals is not known but is probably below 1,000. The three varieties each occur in very limited localities in the humid montane forest zone at altitudes of between 1,200 to 2550m; their habitat is characterized by a scattering of Manacla palms and abundant epihytes. The forest cover has been destroyed in most localities and secondary vegetation predominates, often dominated by the fern Pteridium aquilinum. In most localities the junipers are present with only solitary individuals. The species is mainly found on acid forest soil, but J. gracilior var. urbaniana occupies two limited areas, one near the summit of Pic la Selle between 2300-2550m above sea level and the other on a plain in the Sierra de Baoruco surrounded by forest, both on limestone. The wood is used for furniture and carving, and for firewood. In Haiti, where it does not occur in the wild, this variety is planted as an ornamental tree. No uses are known of the decumbent shrub J. gracilior var. urbaniana. The assessment of the species as a whole is driven by the status of the most common, nominate variety (var. gracilior); the addition of locations from inclusion of the other two varieties (var ekmanii and var. urbaniana) still keeps the number of locations under five. 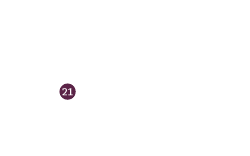 The species is Endangered under criterion B2. Besides cutting for timber and firewood, this species is also threatened by forest clearing for pasture and by (man-made) fires. At least one variety (var. urbaniana) occurs mostly within a national park. Stricter regulation of cutting wood and grazing animals is urgently needed to protect this species and its varieties. Adams, R.P., Jimenez Rodriquez, F., Hoppe, J. & Zanoni, T.A. (2010). Discovery of a new population of Juniperus gracilior var. urbaniana from the Dominican Republic: Analyses of leaf terpenoids and SNPs from nrDNA and trnC-trnD. Phytologia 92(3): 413-423. Farjon, A. (2013). Juniperus gracilior. In: IUCN 2013. IUCN Red List of Threatened Species. Version 2013.1. <www.iucnredlist.org>. Downloaded on 06 July 2013. A.Farjon, 2013. Juniperus gracilior, from the website, Threatened Conifers of The World (http://threatenedconifers.rbge.org.uk/taxa/details/833).